Westwood Fitness: Housed within Westwood Fitness & Sports Center, Westwood Fitness features over 35,000 square feet of fitness equipment including functional training equipment, turf, free weights, Keiser Pneumatic, TechnoGym, Hammer Strength and Matrix equipment, stretching areas and cardio theatre. Westwood Fitness also offers a wide variety of aerobics classes geared for all ages and fitness agendas. An up-to-date schedule for Westwood aerobics classes can be found in our current Activity Guide, located on the left sidebar of this webpage. Westwood is also home to CrossFit Unicus and Wellbeats. CrossFit Unicus is a group fitness class for people of all levels of fitness. CrossFit Unicus classes are available for an additional fee. For more information on CrossFit Unicus, click here. Wellbeats is a collection of on demand virtual aerobics classes and is a supplement to the current schedule of live aerobics classes. Open studio time is available on a first come, first serve basis and fitness users simply access the kiosk and select the class of their choice. Aerobics classes (click here for a class schedule), fitness counseling and equipment orientations are included with membership or payment of the daily drop-in fee of $7.00. Fitness punch cards are also available. View our current Activity Guide for membership and punch card options. 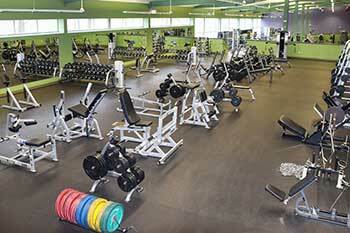 Westwood Fitness also offers personal training and towel rental at an additional cost. Shirts and proper athletic footwear must be worn at all times in the fitness area and common public areas (lobby, hallways, etc.). Kids Gym: Childcare while you workout for kids ages 3 months to 12-years-old. 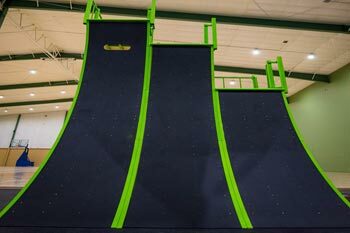 In addition to a mega-playground, Kids Gym features interactive fitness equipment that combines technology, fun and fitness to motivate kids to stay active. This space will open late February/early March. Juice Bar: 100% Natural. No sugar added. Pre-workout, refuel/recovery, meal replacement, veggie, breakfast, trim/low-cal drinks; whey/plant protein and muscle building add-ins; Whole Foods and core supplement snacks. Opening February 4! Basketball/Volleyball Courts: Two NBA size wood basketball courts were recently added to Westwood Fitness & Sports Center. These courts are housed within the Westwood Fitness space, and are available exclusively to Total Fitness Pass holders and drop-in fitness patrons ($7.00 drop-in fee). Westwood’s building #3 features six basketball/volleyball courts. These courts in Building #3 are available for rental ($22/hr fee). There are also drop-in basketball times on the courts in Building #3 several days per week, for a fee of $5. Batting/Throwing Cages & Golf Net: The cages are available for rental during all regular facility hours, and may be reserved up to seven days in advance. The throwing cage is available with a pitcher’s mound for $10/hr. The batting cages are available with pitching machines for $20/hr. 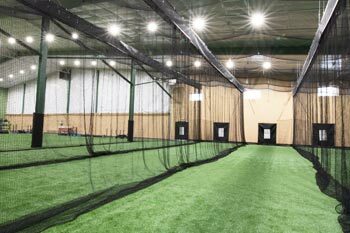 The entire caged turf area is available for $60/hr, a great option for pitching, batting and infield practice/drills. The golf cage is available for $10/hr or $7/half hr. 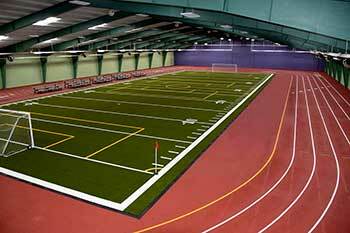 Indoor Soccer/Football AstroTurf Field & Track: Westwood Fitness & Sports Center features a 200-meter indoor track, with a 60-yard soccer/football AstroTurf field. Open track is available during all facility hours for a $5 fee. 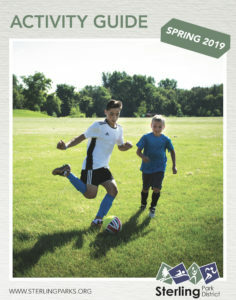 Open soccer is available on the turf Friday’s from 6:00-9:00 p.m. The turf is also available for rental for a fee of $70/hr. Please note there is limited availability of the turf/track during February/March due to high school track practices and meets. Pickleball: Building #3 at Westwood Fitness & Sports Center is home to six permanent pickleball courts, plus three additional courts available for tournaments and other special events. There are $5 drop-in times six days per week, in addition to a variety of programs, tournaments, leagues and lessons. For drop-in hours or more information on pickleball programming, please view our current Activity Guide, located on the left sidebar of this webpage. Racquetball/Wallyball Courts: Two racquetball/wallyball courts are available for rental at Westwood Fitness & Sports Center in building #1. Wallyball rental is available for $22/hr, while racquetball rental fees and times vary during the week. For more information please view our current Activity Guide, located on the left sidebar of this webpage. For the most up to date pricing information, please see page five of our current Activity Guide. Click here to view facility dress code information.